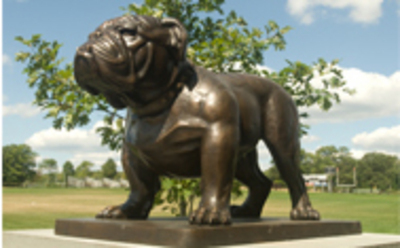 "Class of 2009 Gift -- Two Bulldog Statues Adorning Bulldog Stadium Sec"
On February 11, 2009 the Class of 2009 unveiled their class gift – two new bulldog statues to adorn one of the entrances to the Bulldog Stadium. This gift signified a new era of athletic competition for the University as Bryant was making the transition to Division I athletics. The gift was determined by a vote of the senior class. This announcement was part of the second Senior Class Gift Campaign Week sponsored by the Class Gift Committee. Seniors were invited to visit a table set up each day in the Rotunda from 10 a.m. to 2 p.m. to make a donation. Students who contributed $20.09 (in honor of their class year) or more were invited to a Champagne Toast during Senior Week. Students who gave $50 or received a Bryant water bottle. All students who donated were entered in daily raffles for Dunkin Donuts, Target, Stop & Shop and gas gift cards. They also received a coupon for a free coffee, tea, or hot chocolate at the Scoop. The campaign got off to great start at a kickoff celebration held at the end of October 2008 when more than $12,000 was raised in one night. The goal was $35,000. President Machtley provided an extra incentive for this class to make donations. He challenged the Class of 2009 by stating that if there was a 50 percent class participation rate he would jump into the campus pond. The 2009 Senior Class Gift Campaign was an astounding success and raised $35,003 in gifts and pledges with 414 student donors, garnering 51% participation from their class, surpassing both their financial and participation goals. This was the highest participation from a senior class and broke the record for the highest number of student donors ever from a senior class. So during senior week on May 13, 2009 at 11am President Machtley jumped into the pond with cheers from the fantastic Class of 2009 and the Bryant Community. “The class gift is important because it helps us leave a legacy on campus,” says Normand Duquette (Rehoboth, MA), one of the three Senior Class Gift Committee chairs along with Hannah Jorgensen (Spruce Head, ME) and Anne Koskey-Wagoner (Lynn, MA).